We are proud to announce that we were recently awarded the TMT ‘Best Aerial Filming Services Company UK’ award. We couldn’t wait until the trophy arrived to share this news with you… but promise to post a pic when it gets here. Why not check out the interview with Neil Willis on our work within the industry below. It details how we were one of the original drone operators in the aerial drone filming industry and where our journey has taken us over the last 5 years; from being one of the only operators to have a OSC (Operational Safety Case) with the CAA to operate up to 10m in congested areas to investment into technology and development to offer our clients heavy lift solutions and stabilised VR videography. In the past our award winning team has won a Hollywood award for Exceptional Aerial Photography and regullary compete (and win) drone racing competitions. 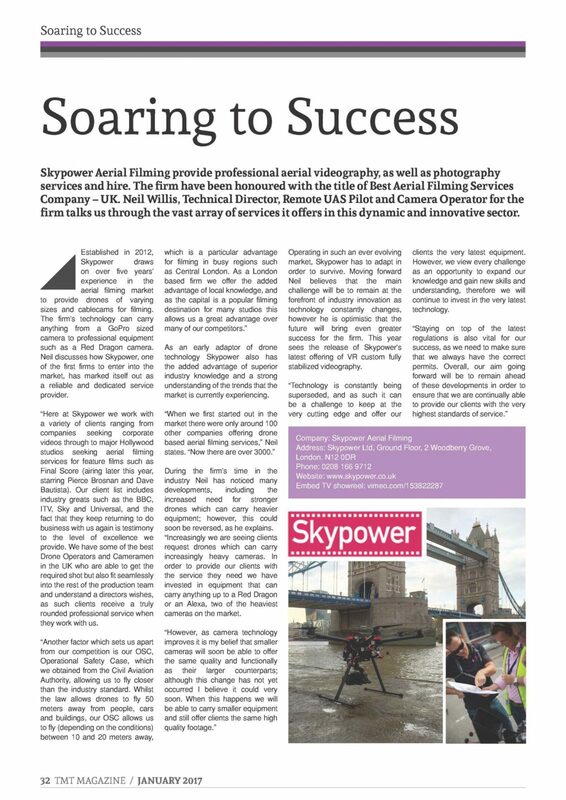 So it’s guaranteed that Skypower will get you the shot!